The report brings to light the need for a breakthrough cooling solution across the world. Our Earth is becoming warmer with each passing year. The Intergovernmental Panel on Climate Change’s (IPCC’s) latest report alerts that surface temperatures are likely to rise by 1.5°C by the year 2050. Global warming could put about 75 percent of the world’s population at risk of potentially deadly heat exposure for more than 20 days per year by 2100, and negatively impact living conditions for many in hot and humid areas. The need for cooling is fast becoming a necessity for well-being and productivity and, in extreme cases, for survival. As temperatures increase, so does our dependence on air conditioners for thermal comfort, and the resulting emissions from these energy-intensive units, which use potent greenhouse gases as refrigerants, causes further warming, creating a vicious cycle. Recognizing the urgent need for efficient cooling without warming the planet, Rocky Mountain Institute released its latest report, Solving the Global Cooling Challenge: How to Counter the Climate Threat from Room Air Conditioners, at the Global Cooling Innovation Summit in New Delhi, India, today. The Global Cooling Prize—an innovation challenge intended to incentivize and reward the development of a residential cooling solution that has at least five times less climate impact—was also launched at the summit, by Dr. Harsh Vardhan, the Honorable Union Minister of Science & Technology, Earth Sciences, Environment, Forest, and Climate Change of India, and other dignitaries from around the world. The report brings to light the need for a breakthrough cooling solution across the world—and particularly in developing countries with hot and humid climates—in order to neutralize the significant economic and environmental impacts that air-conditioning growth portends. The analysis presented in the report shows that rapid scaling and adoption of a residential cooling solution that has five times less climate impact (a 5X solution) would prevent up to 100 gigatons of CO2-equivalent emissions by 2050 and help mitigate up to 0.5°C in global warming by the end of the century. 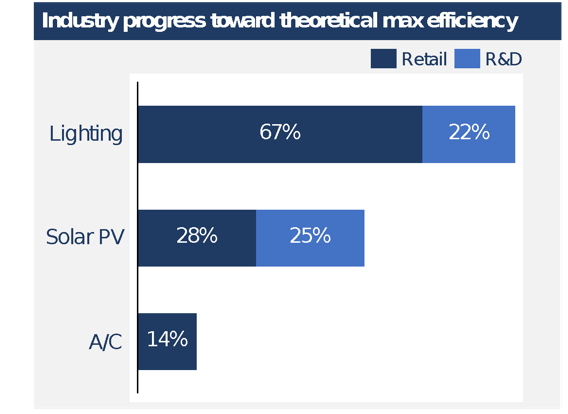 Several market factors have contributed to the sluggish pace of innovation in the air-conditioning (AC) industry, with the key factor being customer focus on low first cost as opposed to life-cycle cost. This has driven the AC industry to focus on economies of scale, resulting in a highly consolidated industry. The AC manufacturers pursue high volumes of sales by selling units to consumers at low prices; those units’ energy efficiencies simply meet or marginally exceed the Minimum Energy Performance Standards. The outcome is no surprise—the best-performing conventional, vapor compression-based, room air conditioners have achieved only about 14 percent of the theoretical efficiency limit, even as we’ve seen a rapid acceleration of technologies toward their theoretical maximums (e.g., LED lighting, solar panels) in adjacent industries. The report estimates the global stock of room air conditioners (RACs) will grow from about 1.2 billion units today to 4.5 billion units by 2050, with developing countries accounting for about a fivefold increase over their present stock. 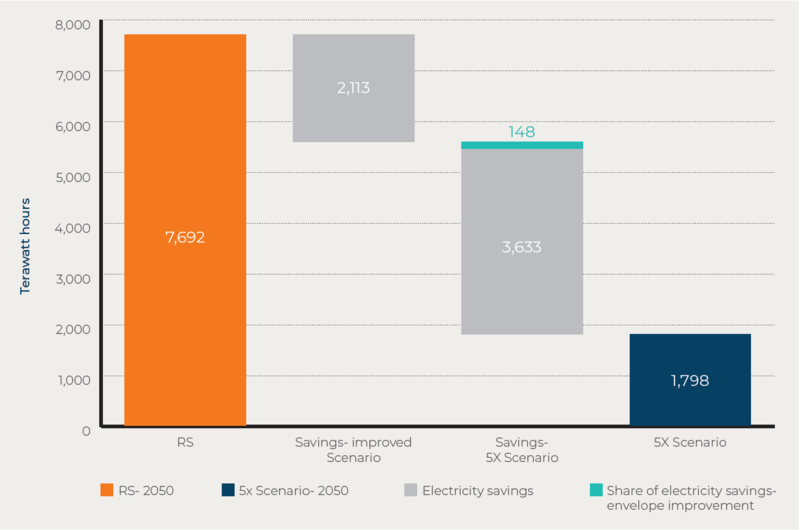 RMI’s analysis suggests that under a business-as-usual scenario (the report’s Reference Scenario [RS]), the projected growth of RACs will require about 2,000 gigawatts of new generation capacity and create a demand for about 5,400 terawatt-hours of electricity—equivalent to the combined current annual electricity consumption of the United States, Japan, and Germany. The resulting emissions, estimated to reach between 132 and 167 gigatons of carbon dioxide equivalents (CO2e) by 2050 cumulatively, would result in a more than 0.5°C increase in global temperature by the year 2100. 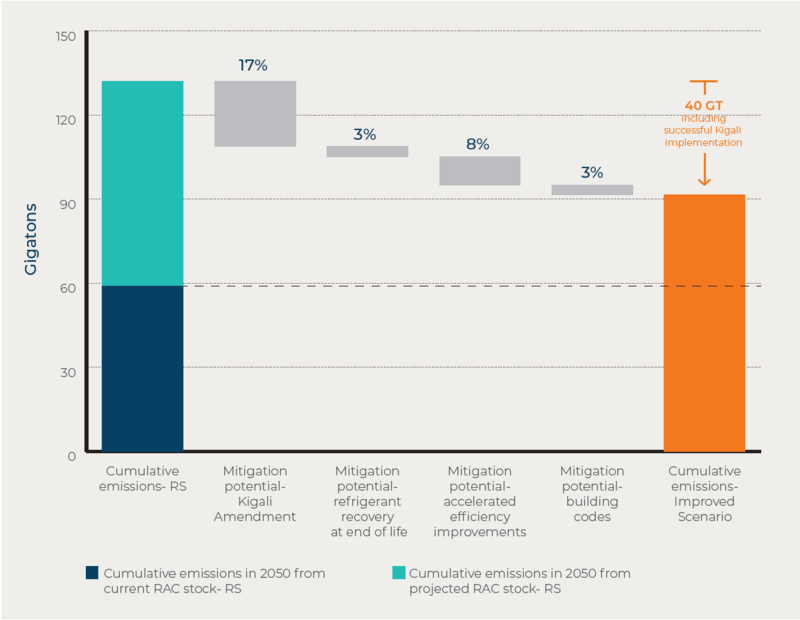 The report assesses the conventional solutions and strategies to map out the extent to which they can potentially neutralize the impacts of RAC growth as part of the report’s Improved Scenario. The analysis shows that even after assuming accelerated steps across policy, technology, and operation and maintenance practices, and assuming full compliance to the hydrofluorocarbon (HFC) phase-down requirement laid down in the Kigali Amendment, we won’t arrive anywhere close to neutralizing the emissions impact of the exponential growth in RACs. Conventional solutions, incremental improvements in technology, and even the rapid deployment of renewables on the grid will address only a fraction of the challenge. The soaring demand for space cooling addresses a critical developmental and social need but, at the same time, represents one of the largest end-use risks to the climate. In order to efficiently meet the world’s booming demand for cooling without contributing to runaway climate change, the report envisions a residential cooling solution with five times less climate impact—the 5X solution. The 5X solution is essentially a combination of reduced electricity consumption and use of an environmentally benign refrigerant in a solution that is resource-efficient and cost-effective. Our analysis suggests that rapid adoption and scaling of a 5X solution by the year 2040 could prevent up to 100 gigatons of CO2e emissions by 2050. The positive impact is equivalent to all the 28 countries in the European Union being made carbon-neutral immediately. The burden on electricity grids will be significantly reduced as well—the resulting electricity savings would avoid over $1.4 trillion in capital spending on new generation assets alone, freeing up this capital for other developmental and national priorities. RMI’s research confirms that the technology largely exists today to support a leap to a five-times-lower climate impact solution. 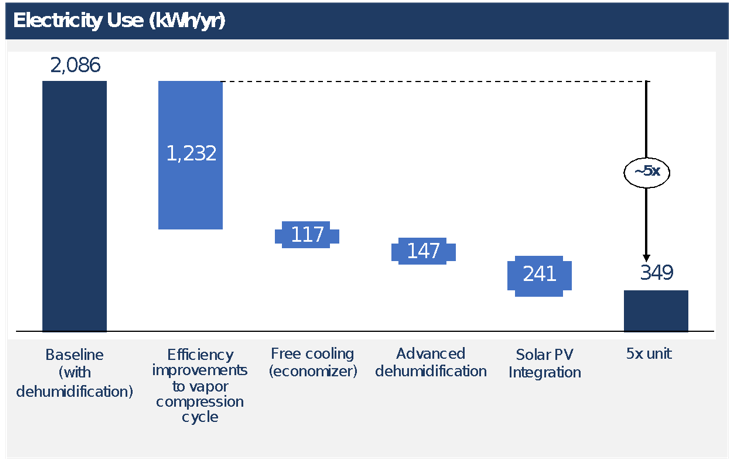 The analysis demonstrates that the electricity consumption of the standard 1.5 ton of refrigeration (TR) room air conditioner can be reduced by about fivefold using existing technologies, which, when combined with a low-global warming impact refrigerant, would achieve at least a five-times-lower climate impact. A number of emerging technologies—such as deep space radiative cooling, thermoelectric cooling, thermionic cooling, magnetocaloric cooling, thermoacoustic cooling, advanced dehumidification using improved desiccant materials, and others—have shown potential in their prototype stages for lower energy consumption and increased cost-effectiveness. These technologies could complement, or even compete with, conventional vapor compression technologies and provide a further opportunity for reduced climate impact. The magnitude of the global cooling challenge serves as an urgent call for action. The solution lies in a radically efficient and climate-friendly cooling technology with five times less climate impact, and it is within our reach. What is needed is the market ecosystem necessary to catalyze and scale this solution, and change agents across the globe must step up to make it possible. Recognizing this, a global coalition of partners has joined hands to launch the Global Cooling Prize: a first-of-its-kind innovation challenge to innovate and revolutionize the AC industry. Administered by Rocky Mountain Institute, Conservation X Labs, the Alliance for an Energy Efficient Economy (AEEE), and CEPT University, the Prize is being supported by the Government of India and Mission Innovation and provides a tremendous opportunity to innovators around the world to develop a cooling solution for a rapidly growing market. It is time for all of us to come together in order to spur the industry, stimulate innovation, and prime the markets for a transformative change. Join the Global Cooling Prize to support us in providing cooling for all without warming the planet! This article was originally published by the Rocky Mountain Institute.